Your next nature adventure in a book. 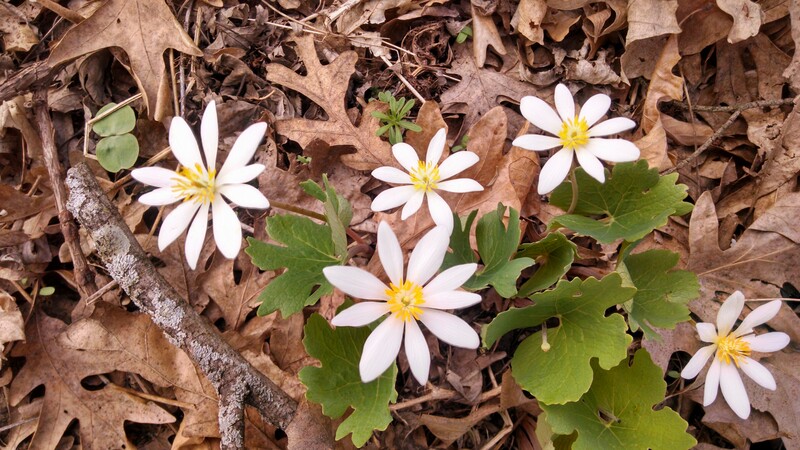 This is a magical season in the forest, as the spring ephemerals are just beginning to bloom. When we think of forest, our minds immediately go to the trees. Right now, with the trees in various stages of budding out, there is not a leaf to be seen. But there is a whole rainbow of color to be found. 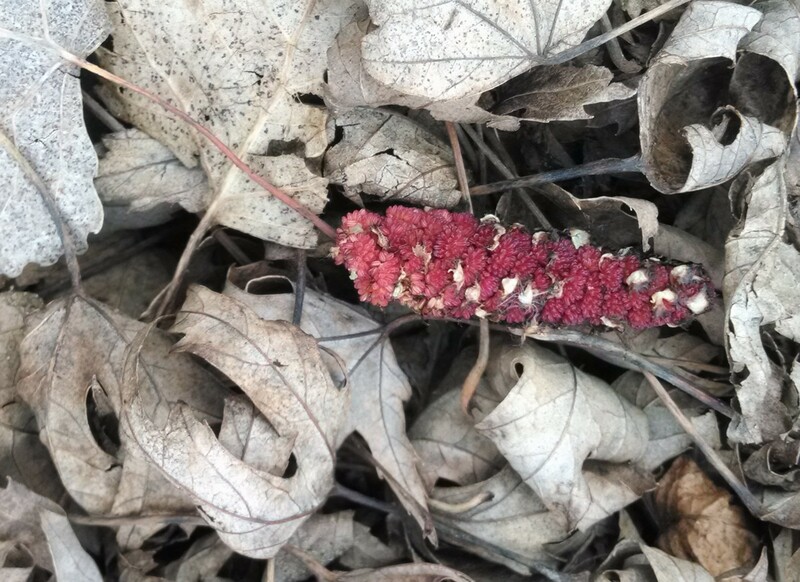 Cottonwood tree inflorescence, brought down in a windstorm (Red). …set 1/2 an orange out on a tray feeder or deck railing to attract the Baltimore Oriole. 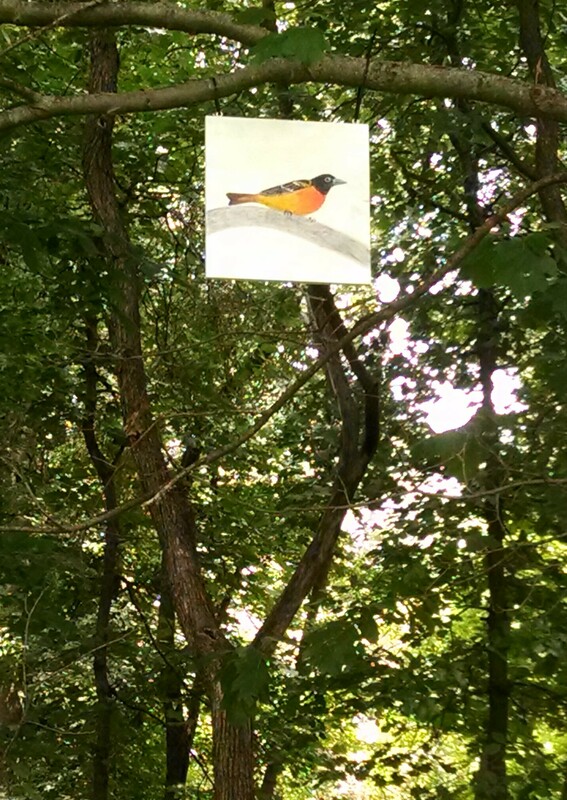 This one, painted by artist Brenna O’Hara, is a permanent resident along ICNC’s woodland trail (Orange). Lots of life is beginning to emerge from the ground. Wildflowers of Iowa Woodlands by Sylvan Runkel and Alvin Bull is a great resource to put in your backpack before setting out. If that’s too big, try the laminated Woodland in Your Pocket pamphlet. Finding flowers is fun: knowing what you’re looking at is thrilling. Bloodroots are one of the first spring ephemerals to explode in the spring (Yellow). Delicate, small forbs take advantage of all of that sunlight streaming through the bare branches to send up their own leaves, flower, and reproduce. 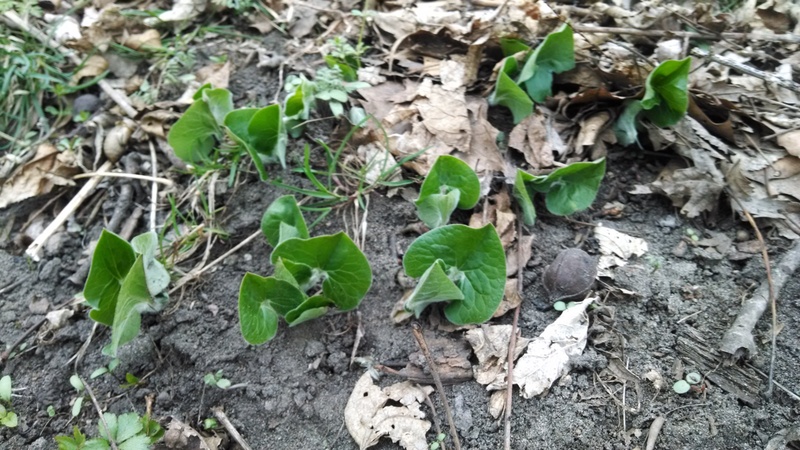 Wild Ginger is just beginning to peek out, with soft folded leaves (Green). Open your copy of Hunting Red to preview the ginger in bloom. 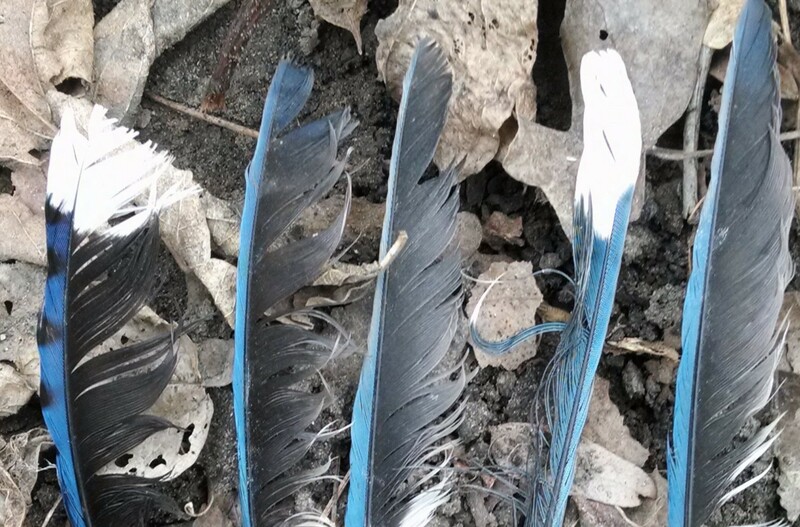 A blue jay was here. As the feathers of most birds are protected, take pictures, not the feathers (Blue). To help identify feathers you find, visit the U.S. Fish and Wildlife Service’s free online Feather Atlas. 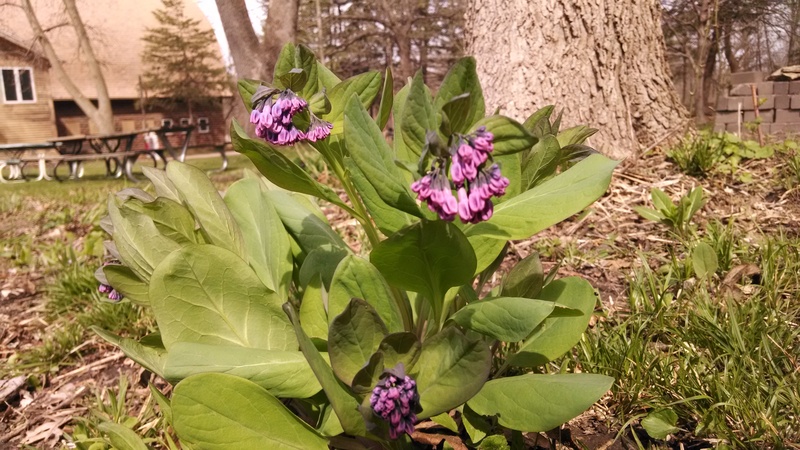 These bluebell flowers have not fully opened, but show some of the great diversity of color within the species (Indigo). 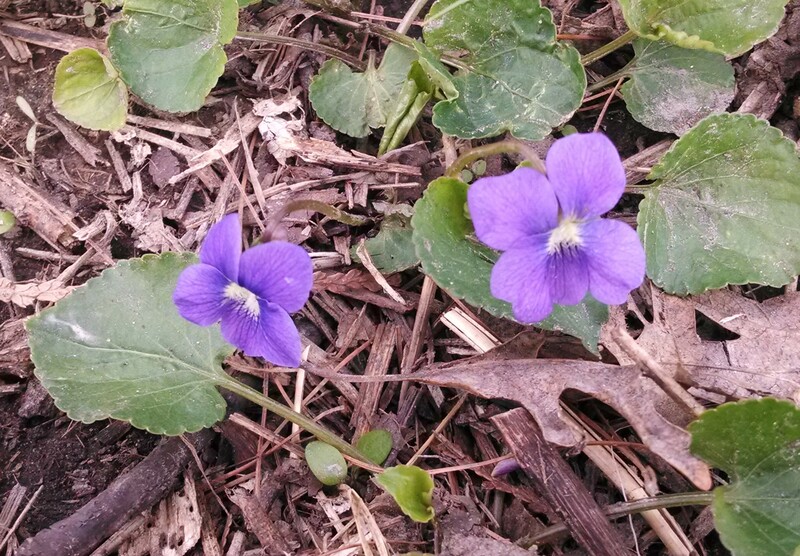 The petals of the wild violet are edible, and are a beautiful edition to any salad (Violet). Spend Earth Day outside, exploring what is happening with the earth as spring surrounds us in a rainbow of color. What colors will you find? < Previous Chirping on Twitter as @pocketmousepub! I love being able to walk onto the land and nibble as I go. And the total lack of prep-work needed makes these so fun (and also pretty in salads). Wonderful nature observations! Did you learn these from books or from someone? Both. I read a lot, but I love walking in the woods with other people, because I always learn something new or experience something different. When I’m out with someone and learn something new, it tends to stick with me better, I think because 1) smaller amount of information being transmitted and 2) there’s a lot more real-world context. 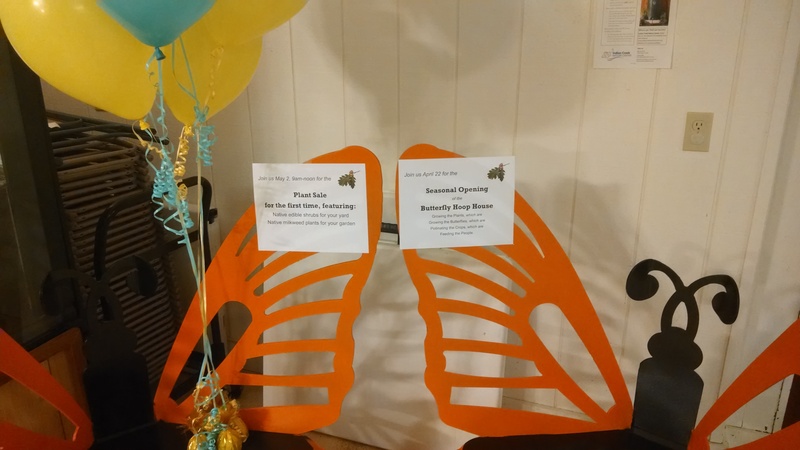 I did go to a program at our local library featuring author Cathy Wilkinson Barash, who’s book Edible Gardens: from Garden to Palate focused on eating primarily domestic flowers and would be a good resource. Indeed, nothing beats first hand from someone experienced. : ) Thanks for replying. Daylighting and view… on What’s in a wall?